The value of chidush as a tool for mediating between past and present appears throughout our sacred texts. The Talmud (Avot de Rabbi Natan) records a conversation between the sage Rabban Yochanan ben Zakkai (30 BCE - 90 CE) and his student Rabbi Eliezer ben Hurcanus (40 BCE - 20 CE), in which R. Yochanan urges R. Eliezer to speak his own unique words of Torah. R. Eliezer resists. Comparing himself to a cistern, he defines his role as one who receives the teachings poured into him as they are given, without adding to or changing them. R. Eliezer sees himself as a vessel for the past. R. Yochanan disagrees. Rather than being a cistern, R. Yochanan urges his students, be a wellspring. In R. Yochanan’s view, we are meant to be a channel for the headwaters, the bountiful source from which new teachings, new chidushim, continually pour forth. To be a student of Torah, then, is to find and add one’s own unique voice to tradition. This act of creative reinterpretation is thought to be so essential that, in another talmudic passage, the great sage Rabbi Yehoshua (a disciple of R. Yochanan ben Zakkai and a colleague of R. Eliezer) declares that there is no beit midrash without chidush. (Chagigah 3a) It can’t exist.Our sage seems to be saying that learning and creativity are inseparable. The beit midrash is, fundamentally, a living laboratory in which the past gets read through the unique lens of human beings in the present, yielding new interpretive possibilities. And it is these new understandings that will shape the future. When R. Eliezer brought his full self to his ancient inherited tradition, something magnificent happened: He came alive. The light within him got activated and new chidushim flowed forth. His creative interpretation was so powerful that the world around him was seen anew. Chidush is how we make the divine more manifest in our world. It is the holy responsibility and sacred joy bequeathed to each and every one of us. Torah teaches us that we are created b’tzelem Elohim, in the image of God, the ultimate creative source. Each of us is a unique vessel for the teachings and traditions of the past and, simultaneously, a channel of creative interpretive flow. In this way, we partner with God to bring forth insights most needed in the present era. Chidush is a sacred practice that has been bequeathed to us by the generations that came before us, and each of us is a link in this chain moving forward. This primal form of connection is one of our more significant pathways to the divine. Through it, we honor what was, connect to what is, and bring into being what will be. This story "‘Is, Was, Will Be’" was written by Adina Allen. 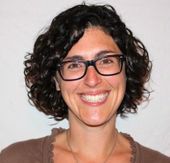 Rabbi Adina Allen is co-founder and creative director of the Jewish Studio Project, an organization that works to activate the inherent creativity of individuals and communities in order to inspire a vibrant, connective, and hopeful Judaism and promote positive social change. Ordained by Hebrew College in 2014, she is an alumna of the Wexner Graduate Fellowship.